Candace H. Johnson-For Shaw Media Josuan Mendez Vazquez, of Chicago, with Fortune Restoration works on painting a cross in the window during the restoration of St. Paul the Apostle Church in Gurnee. 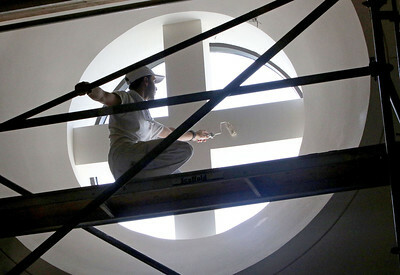 Candace H. Johnson-For Shaw Media Pablo Vega, of Chicago, a painter with Fortune Restoration, works on painting close to a ceiling window during the restoration of St. Paul the Apostle Church in Gurnee. 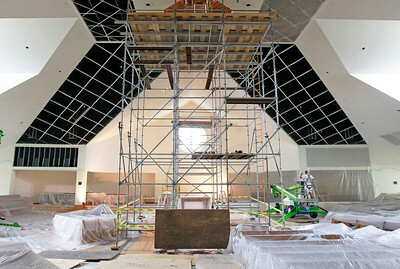 Candace H. Johnson-For Shaw Media Pablo Vega, of Chicago, a painter with Fortune Restoration, works on getting the ceiling ready for acoustical fabric panels during the restoration of St. Paul the Apostle Church in Gurnee. 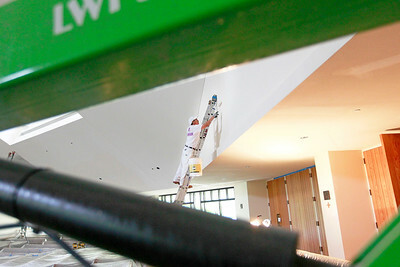 Candace H. Johnson-For Shaw Media Orlando Aguilar, of Chicago, with Fortune Restoration, paints part of the ceiling during the restoration of St. Paul the Apostle Church in Gurnee. Candace H. Johnson-For Shaw Media Antonio Rosalino, of Chicago, with Fortune Restoration, paints one of the walls during the restoration of St. Paul the Apostle Church in Gurnee. 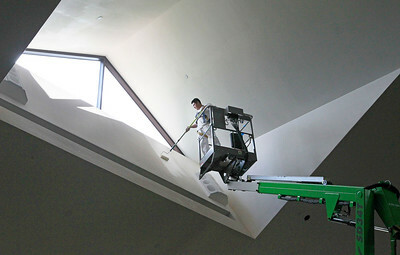 Candace H. Johnson-For Shaw Media Constancio Gonzalez, of Berwyn, with Fortune Restoration, reaches high to paint part of the ceiling during the restoration of St. Paul the Apostle Church in Gurnee. Candace H. Johnson-For Shaw Media Orlando Aguilar, of Chicago, with Fortune Restoration, paints close to the main door leading to the sanctuary during the restoration of St. Paul the Apostle Church in Gurnee. 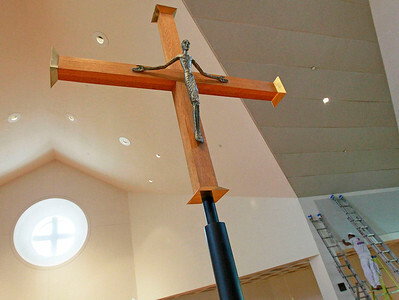 Candace H. Johnson-For Shaw Media A cross has been put back to its original place as Josuan Mendez Vazquez, with Fortune Restoration, puts the finishing touches of paint around one of the acoustical fabric panels during the restoration of St. Paul the Apostle Church in Gurnee. 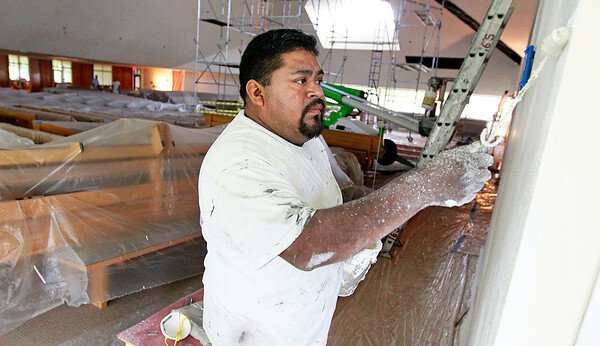 Candace H. Johnson-For Shaw Media Josuan Mendez Vazquez, with Fortune Restoration, puts the finishing touches of paint around one of the acoustical fabric panels during the restoration of St. Paul the Apostle Church in Gurnee. 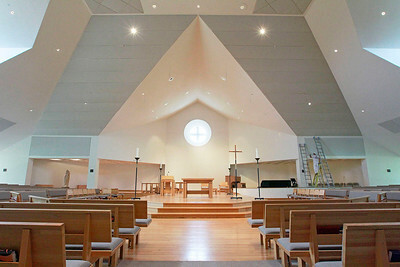 Candace H. Johnson-For Shaw Media St. Paul the Apostle Church in Gurnee during restoration. Orlando Aguilar, of Chicago, with Fortune Restoration, paints close to the main door leading to the sanctuary during the restoration of St. Paul the Apostle Church in Gurnee.